Ah, the weekend of Thanksgiving. The official green light for people to start losing their minds over Christmas. Whether you celebrate by getting trampled at Best Buy to save $50 on a TV or you dig out the holiday décor from the garage, you can feel it in the air. It doesn't even really matter what holiday you celebrate or if you celebrate one at all, the end of the year brings about excitement. A new year is coming and it brings with it mystery, challenge and new opportunities. I admit, I do love the holidays. I am a giant sap, as you well know, and I overflow with emotion and excitement over just about anything that carries tradition and nostalgia around. I also love sparkly gold dresses and parties and hugs and giving people gifts and telling them just how much I love their brains out. I also love wreaths, like really love them. I love making them, I love smelling them, I love looking at them at the farmer's market, and I love seeing them show up on people's doors this time of year. As per usual, my curious mind needed to know more about why we bend sticks and greens into circles and hang them on our door. So I did some research. To my delight, the history of the wreath is a love story! Apollo, son of Zeus, was in love with this girl Daphne. Apparently she wasn't so keen on him and ran off to talk to Peneus, the river god for help. Naturally, he turned her into a Laurel tree. From that day forward, Apollo wore a wreath of laurel as a crown to remember her. Apollo may not have been lucky in love, but he was a symbol of victory and achievement, which is what the Laurel wreath became known for. 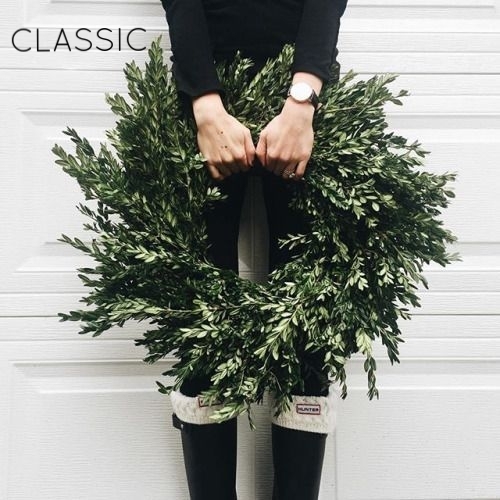 The modern wreath of evergreen is also a symbol of strength, as evergreens are able to withstand the harsh cold of winter. Isn't it so fun to learn!? I have been looking for inspiration for this year's wreath and thought I would share my favorites with you. Help me choose which one to make!